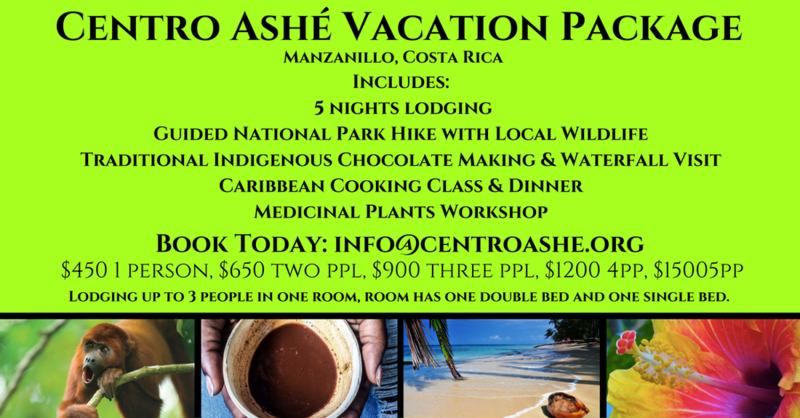 *Transportation to and from Centro Ashé and airfare not included in our vacation package, only listed items are included in this package. Email us which dates you would like to book in order to check availability, then once dates are finalized we work with you to schedule the above activities during your trip! Renting with us helps to support our ongoing community based herbal educational program! 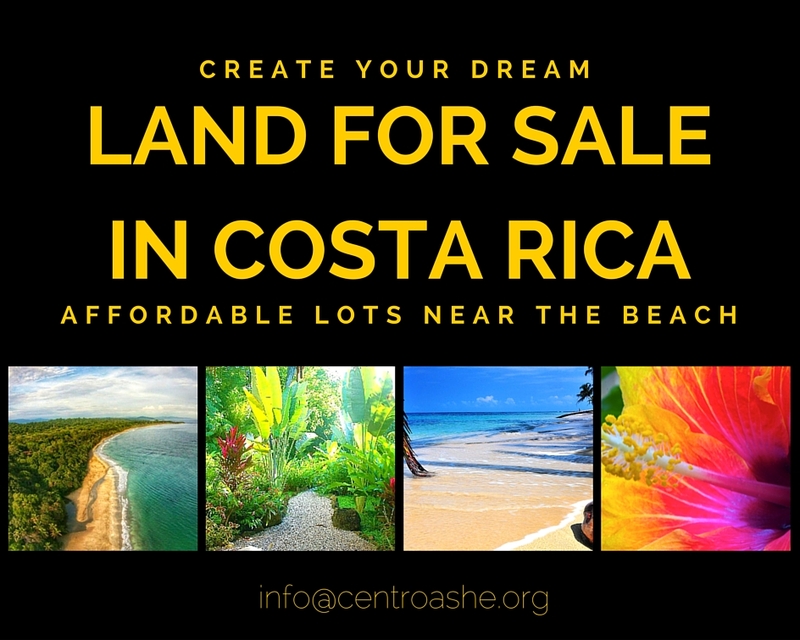 Check out Casa Ashé - Manzanillo, Costa Rica on Facebook and spread the word to anyone you think may be interested! 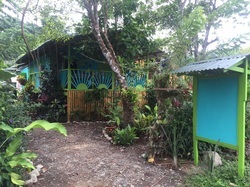 Casa Ashé is our rustic studio cabinas are located in the heart of Manzanillo, one block to the Caribbean Sea, surrounded by our healing gardens! Our studios are available for rent for daily, weekly, and monthly rates. 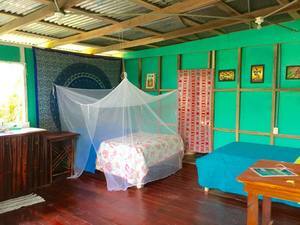 This is a budget friendly and rustic cabina great for those who are looking for simplicity surrounded by gorgeous gardens and amazing proximity to the Caribbean Sea, just one block away! This is a historic wooden structure, surrounded by noni, mango, guanabana (soursop), bidiba (custard apple), cinnamon, ylang ylang, nance, amapola hibiscus, medicinal plants and more! The studio is open concept, including a double bed and a single bed, simple kitchenette with hotplate, pots pans cups utensils, coffee maker, fridge, newly renovated bathroom with hot water, and wifi. Casa Ashé is home to Centro Ashé an herbal education center. 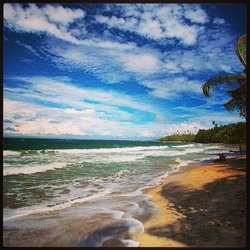 We are located on the Caribbean of Costa Rica in the quiet fishing fishing village of Manzanillo, it is usually high 80's during the day in in the 60's at night. The owners live onsite. Once you are in Manzanillo, from the bus stop walk across the street to Bad Barts Dive Shop and take that street inland one block, take a right and walk 100 meters and see our sign on the left, in front of a blue house. Shuttle Services - Interbus and Caribe Shuttle - Private Shuttle companies offer air conditioned shuttle to pick you up at the airport for $60 or your Hotel in San Jose for $47 and drop you off at Bucus Cabinas. ​*please note we do not issue refunds for payments if you choose to cancel your reservation for any reason. *A non-refundable deposit of 50% is due upon reservation. We will send you an invoice to your email that is connected to our paypal account, you can pay your deposit with any major credit card. The remainder of your payment is due immediatly upon arrival by cash. 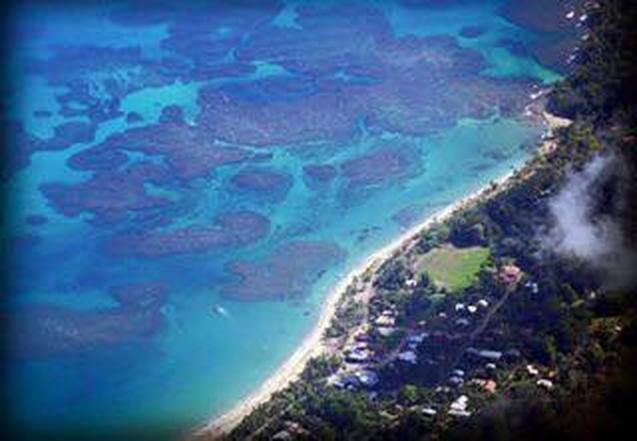 Please come with cash in hand as there is no ATM in Manzanillo.